The first church or chapel of St Mary was built in the oldest part of the town in 1848 (architects Weightman and Hadfield). After extensions in 1866 (architect Joseph Hansom), it was demolished to make way for a much larger church built in 1876-78 (architect George Goldie with additions in the 1890s by Edward Goldie). With the creation of the Diocese of Middlesbrough in 1878, this became the Cathedral and served the central area until population movement made it redundant in the 1990s. Fire destroyed the building in 2000. 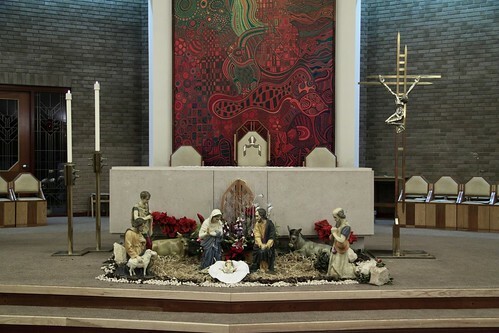 Cathedral status had been transferred in 1986 to a new building at Coulby Newham, one of the new and growing suburbs of the town. This fan-shaped Cathedral (architect Frank Swainston) was conceived by Bishop Augustine Harris based on his experiences of the advantages and disadvantages of the Cathedral-in-the-round at Liverpool.